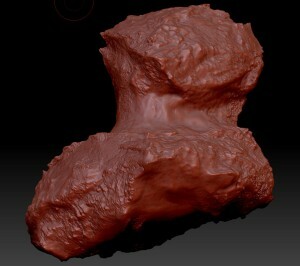 Here is my current work in progress shape-model for comet 67P / Churyumov-Gerasimenko. This model is almost to scale. It is probably not perfectly aligned in rotation and its center might not be exactly in the right place. I hope to refine that using SPICE data. The 3d model is copyright Mattias Malmer. You are allowed to use it for any personal projects and for educational purposes . For anything else please drop me a line at: [mattias at malmer dot nu] I would love to hear from you! This model could not have been made had it not been for the very generous NAVcam team of the Rosetta mission with their prompt release of raw images into the public domain. Thank you for the shape model and the color image, they are beautiful. Hello Mattias, Thank you very much for your great work! It’s really amazing! I am a student working on gas coma simulation of 67P using ESA’s public shape model (version 2). I would like to know if it’s possible to make this 3D model projected as a 2D map? Since this comet is so irregular I don’t think the cylindrical projection is appropriate. Thank you very much and have a nice evening!